The finals for the Class 4 Boys and Girls championships are set following exciting semifinal action on Friday afternoon and evening at Mizzou Arena. MICDS achieved redemption from last year’s final loss to Incarnate Word and will face undefeated Benton in the Girls’ final at 6:20 on Saturday. MICDS has suffered two of their four losses this season to ICW, but won 60-51 and pulled away in the fourth quarter outscoring the Red Knights 21-8. The Rams were led by Taylor Iverson Baur who scored 24 and pulled down 13 rebounds. Rachel Thompson added 13. For the 15th time in 30 wins, the Benton Lady Cards held an opponent to 25 points or fewer in their 37-25 win. Head coach Brett Goodwin call it his team’s “best defensive performance of the year.” Benton held Owensville’s top player Hailey Diestelkamp to 13 points, 11 under her season average on 3 of 11 shooting. 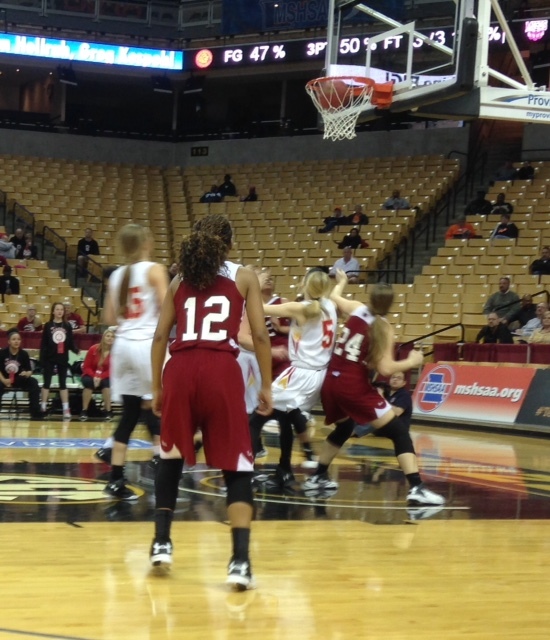 Daejah Bernard led Benton with 13 points, Kylee Williams added 11. In the first boys semifinal, Vashon used a 9-0 run to open the second quarter and break a 15-15 tie. Vashon led multiple times but double digits including their largest lead of 13 with just over a minute to go in the third. 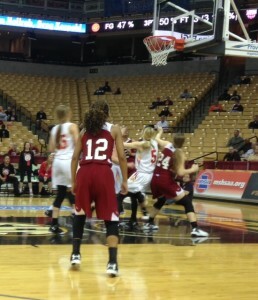 However, Sikeston tied the game at 62-62 on a three-pointer to force overtime. In the final four minutes, Vashon outscored Sikeston 7-4 to punch their ticket to the finals. It’s Vashon’s first trip to the Final Four since 2006 and 22nd in school history. Danile Farris led Vashon with 22 points. Fred Thatch was Sikeston’s leading scorer with 22. Juwon Kimble had a double-double of 13 and 12. In the final game of the evening, Lafayette St. Joe limited Helias to just 14 made field goals while shooting 47% for the game to claim a 68-51 win to move onto Saturday’s final. Three players scored in double figures for the Irish…Sterling Hicks (16), Caleb Bennett (15) and Diego Bernard (14). Helias stuggled from the three-point line, hitting just 2-for-13. Sophomore Landon Harrison had a game high 24 points, hitting a perfect 12-for-12 from the free throw line.